Meet Alexander Melnichenko for this interview in his home-town Odessa, Ukraine. He is a fitness personal trainer and TRX specialist who sees his profession as much more than showing workout exercises to his clients. Physical training gives me a lot of energy and an incredible pleasure. I can really not imagine my life without it! My personal motivator is to never stop pushing the limits and continue developing myself. Like many kids here I started to do push-ups in our courtyard as a 14-year-old. Since then I always knew that being a trainer is going to be my career. With 18 years I started to train for powerlifting in a local sports club. I soon started to work there as a trainer too, which I continued to do for nine years. I this gym with the name ‘Dragonfly’ I learned a lot about training methodology, rehabilitation training, but also about psychology. Later I moved on to other gyms and today I am coaching professionally in the gym from 7 a.m. to 9 p.m. I am happy to have turned my favorite activity into my profession. Sometimes my friends ask me when I do rest at all. My answer is that I don’t really get tired from working as a trainer. What are your main fitness disciplines and specializations? I see myself as a universal fitness trainer. Today I teach TRX, cross fit, rehabilitation and gym fitness. I do also hold TRX workshops and publish my own training videos on a YouTube channel. I think the future of fitness training is not in the gym only. People are looking for a variety of activities from rehabilitation after back problems, to functional training, TRX, cross fitness and others. Some want to achieve a serious goal and others are mostly looking for fun and emotions in the gym. My strength is probably that I can easily connect and work with all these different groups and their goals. What do you consider as your biggest achievement or satisfaction in your work as a personal trainer? I advise clients to change their way of life, take their children and walk with them for two hours on weekends. We do have a terrible deficit of physical activity here: car, office, elevator – Many people are not active enough in their everyday life. Ideally we should walk about ten thousand steps in a day, and on average people make only about two thousand. I teach people to develop their body and mind. We do not just need to take care of our body – if the brain works correctly, then the whole body will work correctly too. A lot of people are nervous because of nothing, and then they start to eat sweets, smoke cigarettes and so on. I talk with people about changing their mind. Many people did actually change their priorities in life. When they were offered a new job they refused it because people were drinking and smoking there. It flattered me, as a coach, that I did not only change their body, I changed the mind of a person. Do you follow any special training methods to achieve your goals? I have a talent to sense people’s needs and motivation, where they want to go and, even what mood they are in on a particular training day. When I feel that a client is upset by something, I give him a lighter training. I think this is possible with my special talent and because I do really love my work. I try to coach each athlete with the same high quality on each workout. It does not matter if it is the first or last session in a long day. For me this high motivation came after I worked with one of my young clients. He was a highly motivated 17-year old athlete, when a car hit him on the bicycle. Together with his family and friends we help him to claim back some of his life with training therapy and by just spending time with him. We became real friends. This experience has completely changed the way I look at my own life. I value every day now, every hour and conduct every training like it could be the last. I watched your videos about this story of Misha Rashchenko and I think it’s great how you don’t let the boy alone in this hard time of his life and how he returns a smile and repeats a sound after you during one of your visits. Do you feel such a strong connection with all your clients? Personal relationship is important in my profession. Sometimes it works better and sometimes it does not work. I always try to understand my client’s true motivations even if they keep it secret. If they want to hear it I give them my best advice. It’s a mutual process. Yes. A trainer does more than just show people how to do some exercises. It’s not that trivial as many people think about this work. Do you work with professional athletes too? I worked with football players. Still, work with tennis players and professional MMA fighters. I train them to be physically prepared for the specific needs in their sports discipline. For example, we strengthen the legs and develop speed with football players. We strengthen shoulders for tennis players, and with the fighters, we increase the force of their hits. My versatility allows me to train different people. I don’t want to prepare professional bodybuilders though. Because I don’t like doping. I believe that it’s unfair. I’m training 35 people right now. They work out three times a week. Then I have some online training clients too. Currently 40 people. They found me through my YouTube channel. I started to share my knowledge with a larger group of people. I am very careful with what I put into my videos. They should be unique and I want people to get a clever workout. 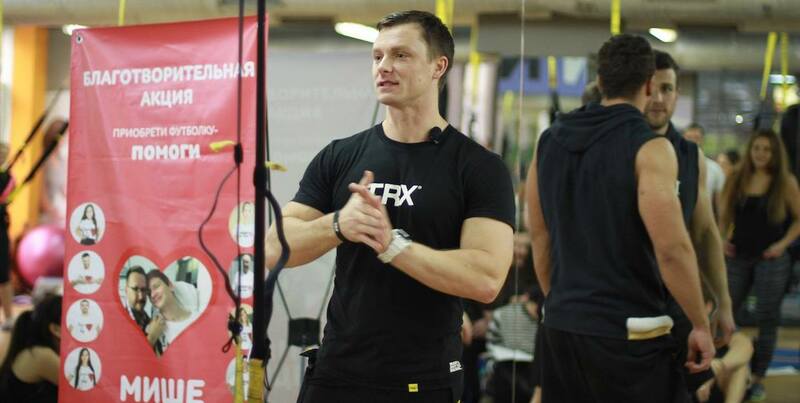 Why did you decide to hold workshops for TRX training? I like to share my knowledge and experience because it helps me to develop myself. In my work I do usually work 1:1 with one client, and when you have 30 people in front of you – it’s a different challenge. Most of the attendants are trainers themselves. My current topics are TRX or rehabilitation training. I want to add a workshop on training in the gym and functional training too now. Since when do you have a YouTube channel? We launched it in October 2016 and created already about 40 videos since in this time. I don’t want to release videos like “Look I am running” “Look I am eating” “And now I am in the street”. All my videos should have a very specific training content. Today we shoot a video about “The Secret of the Buttocks”. The next video will be about rehabilitation training. How do you work with clients online and what do you think about the Fit Drills application? I really like the idea to have training programs on the mobile phone. Some people write me in short messages asking to send them a program for TRX. They might not have the opportunity to train in the club or simply want to do it at home too. Some send me a photograph and a short questionnaire. I will, first of all, tell them to watch the videos on my channel, where I talk about such exercises. Later they send me a video how they perform the exercises. I look at it and correct mistakes. In this way, they can safely train themselves with my online help only. The app can be helpful but as I said they will need more information which they can find in my videos. And they need my correction to do it efficiently and safely. Unfortunately, this is still not possible with the Fit Drills app now. Do you generally recommend your clients to use online tools for their training? I do always advise them to watch my YouTube channel. It is in Russian. I think my content is unique for Ukraine. What is your advice for people who think they don’t need a trainer to workout? Training without a coach can be unsafe – without the right know-how, it is very easy to get injured. And in most cases, it is inefficient too. Men sometimes are very self-confident and tend to take too heavy weights. With the TRX, many people start to train with a neutral position of the spine, which is dangerous. If we talk about efficiency, then sometimes we are lazy. You will never train as intensive alone like with a coach who motivates you. Even I train with a strong partner who motivates me not to give up and give all on each repetition. What is the optimal time to workout and how long should it take? It depends on the individual’s character: some people are night owls, and others are early birds. An optimal training time for building muscle is from 2 p.m to 5 p.m. It has been shown that the body has the maximum concentration of the necessary hormones to build muscles, and fat is burned. On average, a workout should take about 50-60 minutes. Two hours is too much in my view. If the training is properly organized, it will put a great deal of stress on the vascular and hormonal systems. These systems are designed to work effectively for up to 60 minutes. After that, you can still do some cardio training, e.g. walking or running. High-intensity TRX training sessions will take 45 minutes plus 15 minutes for the stretching. During the stretching, the pulse goes down. I never let my clients go before their pulse has dropped to the zone from which it started. What is the difference between training for men and women? What are the current trends? Absolutely all of my female clients want firm buttocks, flat stomach and a beautiful triceps. With 90% of them I work on TRX. And they love it. TRX doesn’t increase muscle mass, but burns calories well and the body becomes more firm. If the girls come in thin, then we will work with weights. Those who want to lose weight work with TRX, elements of Cross Fit and strength for the spine. Many who come into the gym with overweight, have problems with their spine – the stomach shifts the center of gravity and puts their spine under a constant overload which causes pain. The main male audience wants a six pack and big arms. So, they come to build muscle. In autumn and winter we work on building up muscles, and in spring and summer we burn fat to show them. Many of my male clients like TRX and Cross Fit too. Especially those who want to maintain their form. Muscles grow when you rest. We actually destroy muscle fibers during the training. Ultimately my clients grow muscles while resting and eating good food. Here’s an example: My client asks me to make his car more powerful. I’m tuning it and it gets really powerful. If he fuels it with the cheapest gas, their car won’t be as powerful as it could be. Let’s apply this to the sport. It all depends on the right food. There are no magic tricks. I can’t wave a magic stick like Harry Potter, and give my clients a beautiful body. If they eat wrong, drink alcohol, smoke – the body will be in constant stress, and hormones will be released that destroy the newly built muscle tissue again. Do you create meal plans for your clients? Of course. Depending on the result we want to achieve, I calculate, how much protein, fat, carbohydrates, vitamins a client should eat. I will then also recommend detailed menu plans – how much and which nutrients they should eat per day in order to achieve maximum results. I don’t measure people’s body weight or body measures though. In my experience, it’s better, if they don’t focus too much on just one figure which depends on many other factors. For example, if they eat a salty meal in the evening, this will show on the balance next morning and cause unnecessary disappointment. Can you give some general advice here for an optimal nutrition for athletes? The main problem in my view is that the time is too long between meals and then people eat big quantities. Instead they should eat small portions but more often. It is important to eat balanced. In general people have to learn to control themselves, because there are many temptations everywhere. I tell my clients that I can control their behaviour for an hour, but they need to do the same for the remaining 23 hours. As en example they need to drink two liters of water a day and minimise juice, tea and coffee. What were the biggest changes in fitness training in the last few years? During the last five years there was a trend away from training on the machines in the gym towards more functional training including TRX and CrossFit training and also back to the classic weightlifting. People want to work out everywhere – at home, in the nature or on a business trip. I learned about CrossFit and TRX early on and soon became a certified TRX trainer which is my passion for the last four years now.